The recently launched Plaza Premium Lounge at the international and domestic Kempegowda International Airport prepares you for the long tedious flight ahead. A haven for weary travellers looking for a relaxing environment, it also offers healthy food and beverage options and some much needed pampering. Prepare for the tiring journey ahead by availing services like spa sessions, enclosures for private meetings, wi-fi, printing and faxing facilities, a delectable buffet and range of freshly baked goodies. The interiors are an elegant mix of deep rich browns interspersed with lighter shades of coffee and cream. The soft lighting fixtures caught our attention a�� wooden cage-like shades casting beautiful shadows across the dining space. Designed by Mitchel Squires of Sydney, whose clients include Givenchy and Armani, the lounge is truly world class. 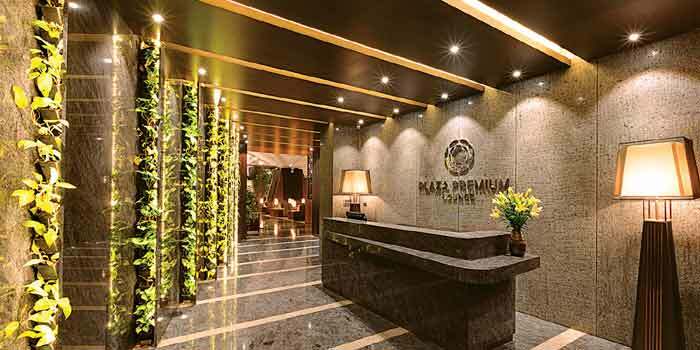 a�?The look and feel is in tune with international traveller expectations with some elements of the spirit and essence of Bangalore through the lush green plants,a�? says Linda Duo, PR and communications manager of the international chain. The food is freshly made, low on spice and grease for a safe and non-turbulent journey. The Food Bazaar offersA� live counters dishing up dosas, pastas, eggs and tossed salads. In the evenings, snacky bites like chaat, jalebis and noodles will also be served. A first at the Kempegowda International Airport, Duo explains the challengess involved. a�?We cana��t bring in knives or any sharp objects, so everything has to be chopped outside, ahead of time. If therea��s an emergency, our chefs use plastic knives,a�? she smiles. 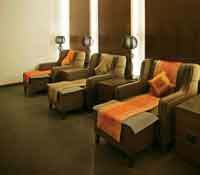 For some quick pampering, The Cocoon offers 40-minute body massages and foot reflexology to de-stress, reboot and revitalise you before you board (Rs. 500 upwards). Fancy a relaxing shower? There are soothing power showers to give you a quick refresher. Present in major hubs like Hong Kong, Beijing, Macau, Kuala Lumpur, Singapore, Toronto, Riyadh and Sydney, India has Plaza Premium at the New Delhi and Hyderabad airports, apart from Bangalore.